The objective of this example is to receive audio input through Zedboard or Zybo board's line input, process it on the FPGA and transmit the processed audio to a speaker. The above figure shows the high-level architecture of such a system. It uses an audio codec to interface to the peripherals and to convert analog to digital signals and vice-versa. 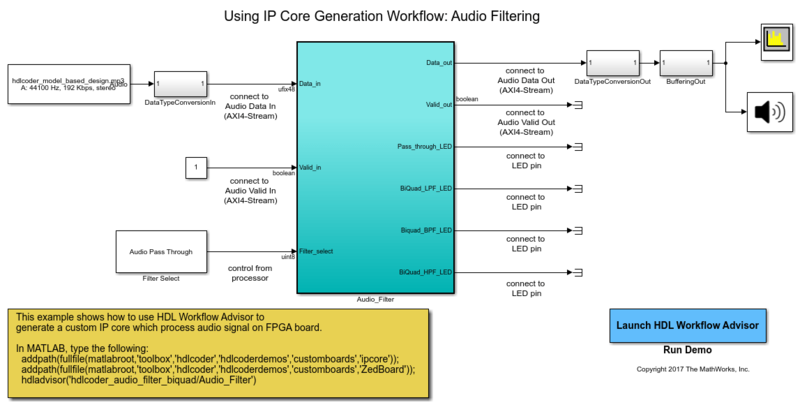 The Audio Codec IPs are used to configure the audio codec and for transferring audio data between Zynq Soc and audio codec. The Filter IP is used for audio processing. ARM processor is used to control the type of filter to be used i.e. low pass, band pass or high pass. To setup the Zedboard board, refer to the "Set up Zynq hardware and tools" section in the Getting Started with HW/SW Co-design Workflow for Xilinx Zynq Platform example. Connect an audio input from a mobile or an MP3 player to LINE IN jack and either earphones or speakers to HPH OUT jack on the Zedboard as shown below. Similar setup can be done on Zybo board. For Zybo board setup, refer to "Set up the Zybo board" section in the Define and Register Custom Board and Reference Design for Zynq Workflow example. In the following model, an audio file is used as input to the DUT subsystem, Audio_filter. On simulating this model in Simulink, the processed audio effect can be heard through the Audio Device Writer block and Spectrum Analyzer block displays the spectrogram of the filtered audio output. 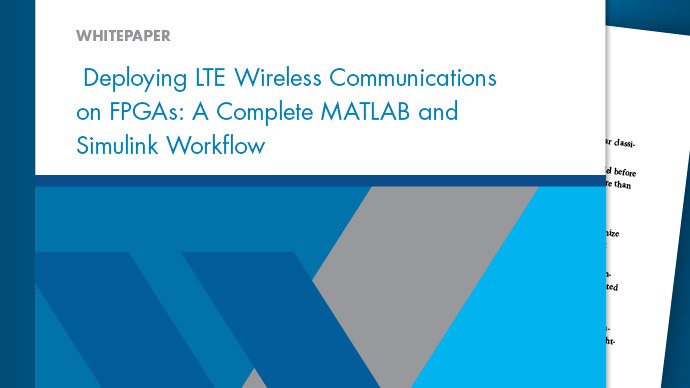 Filter coefficients may be generated using a matlab function or in Simulink. In this model filterDesigner tool is used to generate the filter coefficients for each type of filter. Then these filter coefficients are exported and stored as a matlab file. These coefficients will be used to design the filters in Simulink. In this model, discrete IIR filter blocks from Simulink are used as Biquad low pass, band pass or high pass filters depending on the corresponding filter coefficients. 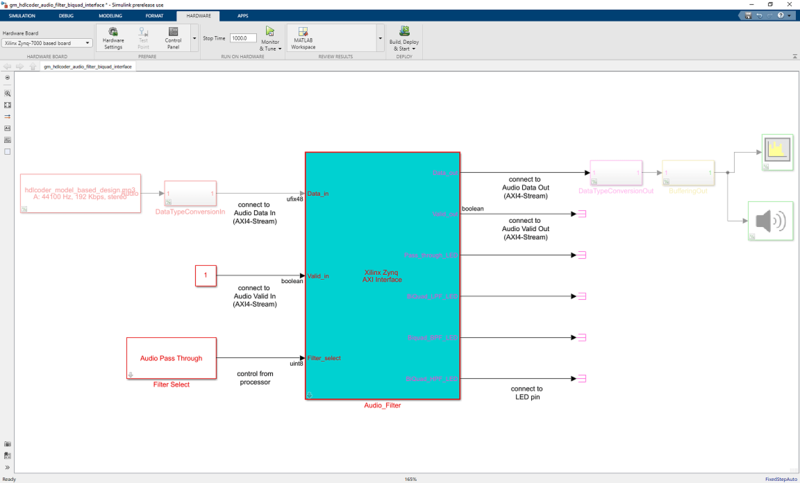 The user can test this model by simulating the model in Simulink. The range of frequencies seen on the Spectrum Analyzer and the audio effect heard through the Audio Device Writer block should vary depending on the type of filter selected. Filter Select block is used to select the type of filtering to be done on the audio input. In order to implement this model on Zedboard, you must first create a reference design in Vivado which receives audio input on Zedboard and transmits the processed audio data out of Zedboard. For details on how to create a reference design which integrates the audio filter model, refer to Authoring a reference design for audio system on a Zynq board example. For Zybo board, refer to Authoring a reference design for audio system on a Zybo board example. In the reference design, left and right channel audio data are combined together to form a single channel. They are concatenated such that lower 24 bits is the left channel and upper 24 bits is the right channel. In the Simulink model shown above, Data_in is split into 2 channels i.e. left and right accordingly. Their magnitude is divided by 2 and the 2 channels are added together to form a single channel. Filtering is done on this channel. Data_in and Valid_in are the AXI4-Stream signals. To understand how AXI4-stream interface is used, refer to "Model Streaming Algorithm with Simplified Streaming Protocol" section in the Getting Started with AXI4-Stream Interface in Zynq Workflow example. Data_in contains the audio data to be processed and Valid_in acts as the enable signal. Each filter is mapped to an LED on Zedboard or Zybo board to visually indicate whether the filter is on or off. FilterSelect input is controlled via AXI4 LITE interface. Next, you can start the HDL Workflow Advisor and use the Zynq hardware-software co-design workflow to deploy this design on the Zynq hardware. For a more detailed step-by-step guide, you can refer to the Getting Started with HW/SW Co-design Workflow for Xilinx Zynq Platform example. For Zybo board use the following commands. 3. Start the HDL Workflow Advisor from the DUT subsystem, hdlcoder_audio_filter_biquad/Audio_filter or by double clicking on the Launch HDL Workflow Advisor box in the model. 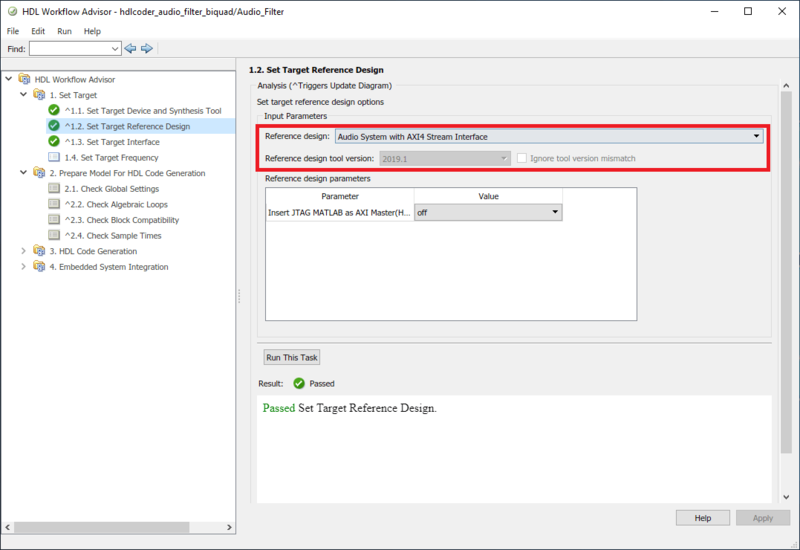 The target interface settings are already saved for Zedboard in this example model, so the settings in Task 1.1 to 1.3 are automatically loaded. To learn more about saving target interface settings in the model, you can refer to the Save Target Hardware Settings in Model example. In Task 1.1, IP Core Generation is selected for Target workflow, and ZedBoard is selected for Target platform. If you are using Zybo board then select ZYBO as Target Platform instead of Zedboard. In Task 1.2, Audio System with AXI4 Stream Interface is selected for Reference Design. The AXI4-Stream interface is used for transferring audio data between the reference design and the filtering algorithm IP. The AXI4-Stream interface contains data (Data) and control signals such as data valid (Valid), back pressure (Ready), and data boundary (TLAST). At least Data and Valid signals are required for AXI4-Stream IP core generation. 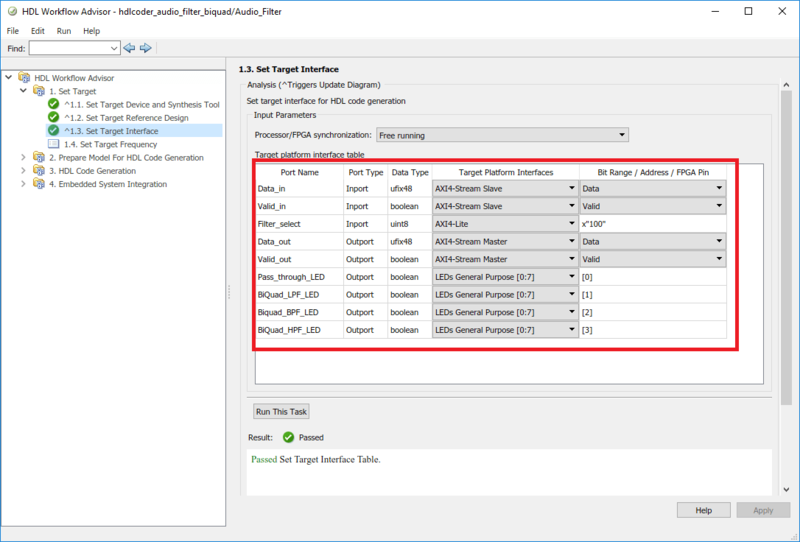 In Task 1.3, the Target platform interface table is loaded as shown in the following picture. The audio data stream ports, Valid_in, Data_in, Valid_out and Data_out,are mapped to the AXI4-Stream interfaces, Pass_through_LED, BiQuad_LPF_LED, BiQuad_BPF_LED, BiQuad_HPF_LED are mapped to the LEDs on Zedboard and the control parameter port Filter_select is mapped to the AXI4-Lite interface. If you are using Zybo board then map the LEDs to the filter manually by selecting LEDs General Purpose[0:4]. 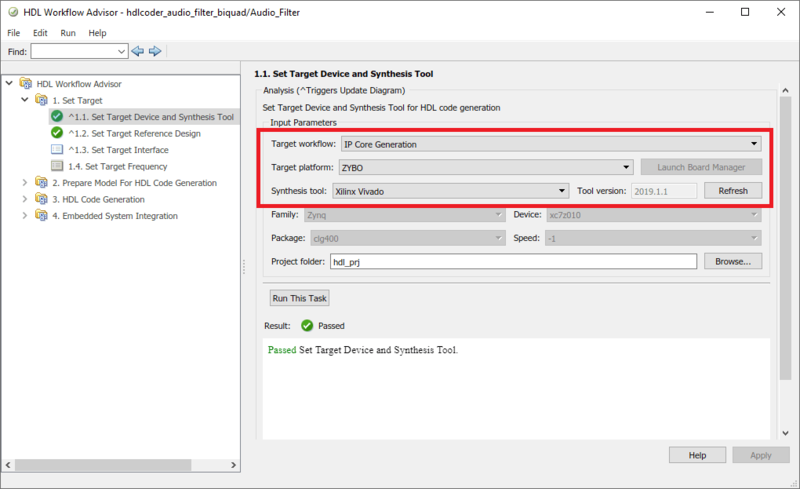 Next, in the HDL Workflow Advisor, you run the Embedded System Integration tasks to deploy the generated HDL IP core on Zynq hardware. 1. Run Task 4.1, Create Project. This task inserts the generated IP core into the Audio System with AXI4 Stream Interface reference design. As shown in the first diagram, this reference design contains the IPs to handle audio data in and out of Zedboard. The generated project is a complete Zynq design, including the algorithm part (the generated DUT algorithm IP), and the platform part (the reference design). For details on how to create a reference design which integrates the audio filter model, refer to Authoring a reference design for audio system on a Zynq board or Authoring a reference design for audio system on a Zybo board example. 2. Click the link in the Result pane to open the generated Vivado project. 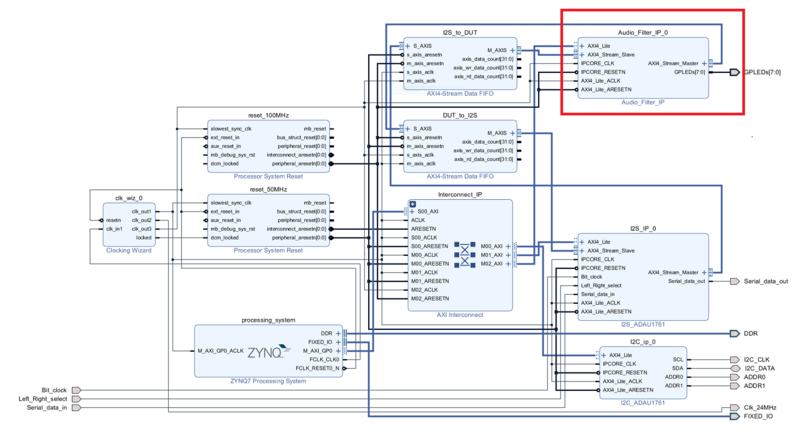 In the Vivado tool, click Open Block Design to view the Zynq design diagram, which includes the generated HDL IP core, other audio processing IPs and the Zynq processor. 3. In the HDL Workflow Advisor, run the rest of the tasks to generate the software interface model, and build and download the FPGA bitstream. 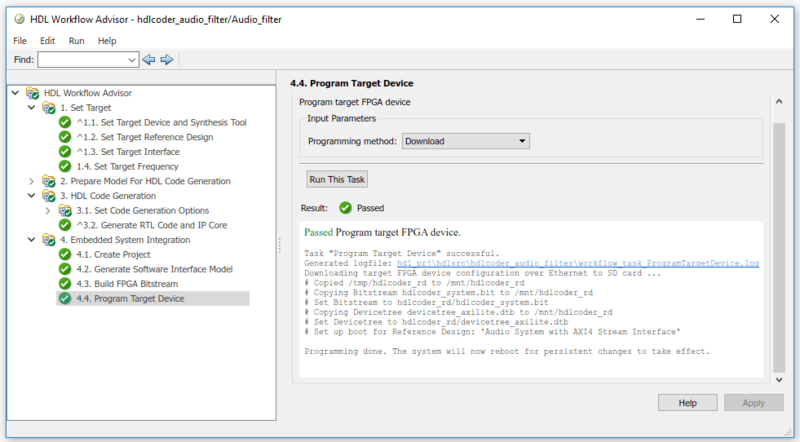 Choose Download programming method in the task Program Target Device to download the FPGA bitstream onto the SD card on the Zynq board, so your design will be automatically reloaded when you power cycle the Zynq board. A software interface model is generated in Task 4.2, Generate Software Interface Model. 1. Before you generate code from the software interface model, comment out the audio input source and audio output sink i.e From Multimedia File, Data Type Conversion, Buffer, Audio Device Writer and Spectrum Analyzer Blocks. These blocks do not need to be run on the ARM processor. The Audio_filter IP is running as *Filtering_Algorithm" on FPGA fabric. The ARM processor is using AXI4-Lite interface for selecting the filter type i.e. Biquad Low pass, band pass, High pass or Pass Through. Click the Run button on the model toolstrip. 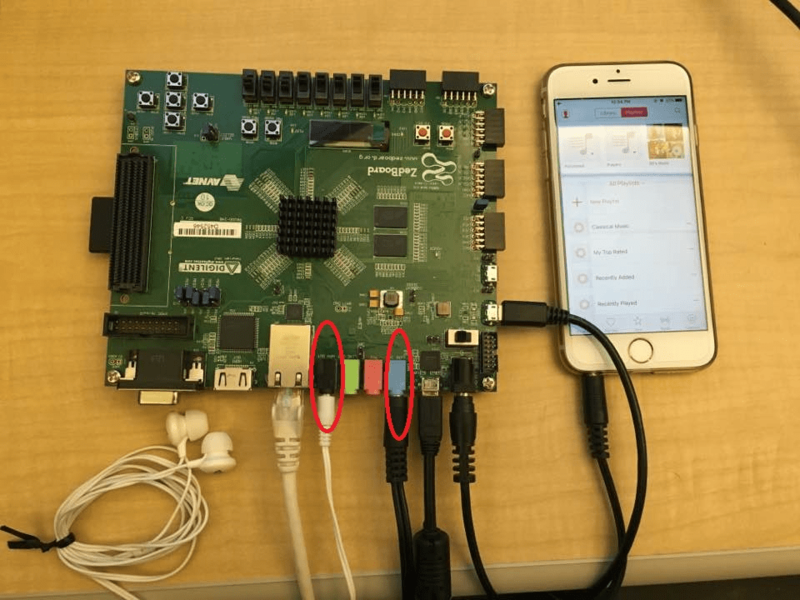 Embedded Coder builds the model, downloads the ARM executable to the Zynq board hardware, executes it, and connects the model to the executable running on the Zynq board hardware. The filtered audio output can be heard by plugging earphones or speakers to HPH OUT jack on the Zynq board. Depending on the filter selected, the corresponding LED on the Zynq board turns on. 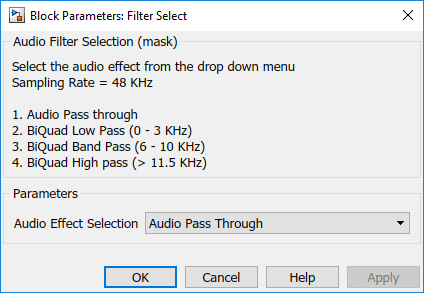 In this example, LD0 turns on when Pass through (No filter used) option is selected, LD1 turns on when Biquad Low pass filter is selected, LD2 turns on when Biquad Band pass filter is selected and LD3 turns on when Biquad High pass filter is selected.